My publisher is holding a giveaway sweepstakes to celebrate the recent release of my new book. 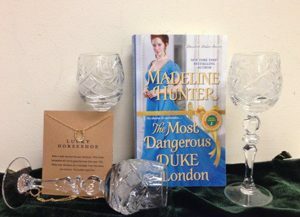 One winner will receive a set of 6 crystal cordial glasses and a horseshoe pendent. If you have read the book you will recognize how both gifts are themed to the story! To enter, go to http://ow.ly/wqEo30bJu4v and fill out the form. You can enter until June 26.